Melt butter in 4-quart Dutch oven over medium-high heat. Cook celery and onion in butter 6 to 8 minutes, stirring occasionally, until tender. Remove Dutch oven from the heat. Gently toss celery mixture and remaining ingredients, using spoon, until bread cubes are evenly coated. Use to stuff one 10- to 12-pound turkey. Or to bake stuffing separately, grease 3-quart casserole or rectangular baking dish, 13x9x2 inches. Place stuffing in casserole or baking dish. Cover with lid or aluminum foil and bake at 325°F for 30 minutes; uncover and bake 15 minutes longer. Don’t cut the cubes of bread too big—more surface area equals more savory flavor. Explore the new world of excellent breads for making a batch of stuffing. Most groceries now carry an almost unlimited assortment of artisan-style breads—sourdoughs, rye, whole-grains, garlicky herb, even cornbread or gluten-free loaves. Switch up what you use, depending on the rest of your menu or your personal taste and texture preferences. Anticipate making stuffing to accompany holiday or even everyday meals (go beyond partnering with turkey, think stuffed pork chops or a crisply browned roast chicken). Designate a large resealable freezer bag as your bread “pantry”, adding pieces of leftover bakery bread that’s beginning to dry out or the heels of your favorite sliced breads. Tear or coarsely chop the bread into chunks before adding it to the bag to maximize how much you fit into it. To boost stuffing nutrition, add a few more veggies with the celery—a handful of chopped parsnip or fresh fennel will enhance the texture of the stuffing. While you’re at it, toss in some chopped fresh parsley to freshen up the herbal flavors of the dried thyme and sage. First of all, there’s the whole “what do you call it?” debate. Most cooks believe that the method of preparation should determine what you call this dish. If it’s a crumbled-bread dish that’s baked in poultry’s internal cavity and roasted, it’s stuffing, but if that same dish is prepared in a separate, freestanding container, then it’s usually called dressing. That guideline, while followed in most regions of the country, is tossed aside in the deep south, where every bread-forward side dish goes by the name “dressing.” Whew! And we haven’t even brought up the cornbread vs. yeast bread debate yet! No worries, whatever you call it and however you want to prepare it, we’ve got you covered with a homemade stuffing recipe that will have everyone at your gathering asking for seconds, thirds and maybe even a bag of leftovers to take home. 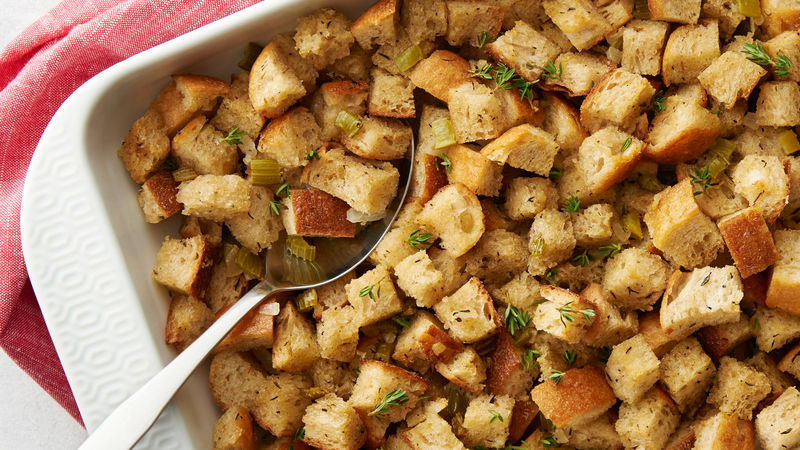 Once you’ve mastered some of the basics for easy turkey stuffing, you can branch out with some all-year-long stuffing recipe ideas.